My thanks to Greenwillow Books and Edelweiss for providing me with a digital review copy. No compensation was provided for this review, and all opinions are my own. Lee Westfall has a secret. She can sense the presence of gold in the world around her. Veins deep beneath the earth, pebbles in the river, nuggets dug up from the forest floor. The buzz of gold means warmth and life and home—until everything is ripped away by a man who wants to control her. Left with nothing, Lee disguises herself as a boy and takes to the trail across the country. Gold was discovered in California, and where else could such a magical girl find herself, find safety? WALK ON EARTH A STRANGER by Rae Carson introduces us to Leah “Lee” Westfall, a young woman from Georgia who helps her parents in their work as gold prospectors. The year is 1849 and the Southern gold rush has passed, leaving many formerly successful prospectors in financial difficulties. Lee’s family is barely making ends meet panning for gold when tragedy strikes and Lee is forced to set off for California to seek her fortune. For the large part, Lee’s experiences prove this to be true. But on her journey to California Lee also finds that some people can also be uncommonly kind. With all that she’s lost, alone and frightened, it would’ve been easy for Lee’s narration to become dark and depressing. Bit despite the gritty (figuratively and literally, y’all) reality of her circumstances, WALK ON EARTH A STRANGER is decidedly hopeful. Lee’s gold sense allows her to physically feel when gold is nearby, and it enables her to seek it out from far away. It’s an ability that she’s had for her whole life, but has kept it secret from everyone but her family for fear of being exploited or branded a witch. WALK ON EARTH A STRANGER is definitely historical fantasy, but be aware that much more emphasis is place on the historical elements rather than the fantastical. Rae Carson does a wonderful job of incorporating historical information into her story to create a rich and nuanced portrait of the U.S. in the mid-19th century but there’s little fantasy world building to be found. Since Lee herself doesn’t understand why or how she has her gold sense, I wasn’t surprised that those questions aren’t answered for us in the series opener. I expect to see more about her abilities in the sequels. Carson’s secondary characters are dynamic and layered, and their stories and experiences helped Lee conceptualize the realities of the world around her. Mrs. Joyner was a standout for me because she was so realistic: there was nothing simple or cut and dried about her behaviours or treatment of others. Initially she is often unkind to Lee, but she very slowly comes around and begins to appreciate Lee’s work ethic and compassion. There was also an awesome French Canadian family among the group of travelers that Lee joined up with, which was awesome to see! The characters in WALK ON EARTH A STRANGER are a diverse bunch, including main characters like Lee’s best friend (and potential love interest) Jefferson who is half Native American. His struggle to carve out an identity for himself as a person of mixed heritage was subtle but powerful, particularly when Lee’s group of travelers encountered other groups of Native Americans on the trail to California. Although her friends and traveling companions are a huge part of WALK ON EARTH A STRANGER, make no mistake: this is Lee Westfall’s story. She experiences so much loss and hardship on her quest to reach California; seeing how Lee rose to those challenges – and sometimes collapsed under their weight – made me respect and admire her. Character growth is definitely the name of the game in this one, as we see Lee learn to trust and make friends all while standing up for her principles. My one criticism of WALK ON EARTH A STRANGER is about the villain, Lee’s uncle Hiram. He came across as one-dimensional and kind of cliché; the sort of villain who twirls his mustache while counting his piles of gold coins. But I have a theory about him that, if it pans out, has the potential to elevate Hiram into the realm of interesting villains pretty darn quickly. If you’ve read the book and want to see my thoughts on him then open my spoiler tag below. Since Lee’s mom was romanced by Hiram before she ran away with Lee’s dad, I am fully expecting Hiram to be revealed as Lee’s biological father later in the series. If that is the case, his villainy will seem less randomly evil and more nuanced. I am so impressed with WALK ON EARTH A STRANGER that Rae Carson’s other books have rocketed to the top of my wish list. I won’t be surprised if this title ends up on my “Best of 2015” list, nor will I be surprised to see it counted among others’ favourites. 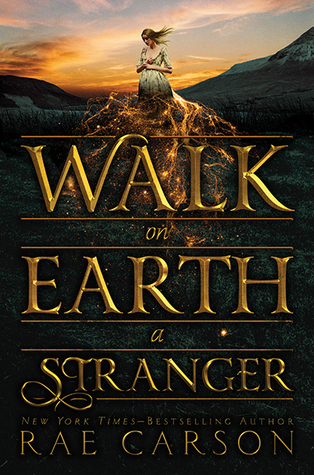 If you take a chance on one new YA fantasy novel this autumn, make it WALK ON EARTH A STRANGER. Have you read or do you plan to read WALK ON EARTH A STRANGER? Do you think historical SFF should make an effort to represent diverse voices that are traditionally suppressed in historical narratives? Inquiring minds want to know! I can’t wait to get to this, my copy is just sitting there waiting for me. Every review I’ve read has been positive and glowing so I hope to read this very soon. Duuuuuuude I’m so excited to read this. When I heard that you liked it I went to Edel to request it. Then I kind of forgot I did that and when I got approved this Monday it was a very nice surprise. Everyone I know who has read this loved it. Very psyched when I heard from someone else that the theme is “westerny”, I’m a huge sucker for that. I’m intrigued by this one, as a history graduate I always love a good historical book, and historical fantasy is always a plus for me. I will definitely be reading… eventually. But when I don’t know. My TBR pile just doubled in the past two days so I am not allowed to buy any new books for the next month at the rate I’m going! I’m a little disappointed to hear that the ‘villain’ of the books is so one dimensional, I like my bad guys to have something to them, a small backstory to help me understand why they’re acting as they are. It won’t put me off, though, fingers crossed I’ll get around to this soon. Planning on it! I need to pick up my copy from the library, it’s currently waiting. 🙂 I’m glad you liked it! I’m surprised you haven’t read her other trilogy yet. And yes, I do think it’s as important to have diversity in fantasy as it is in contemporaries. There’s really no reason why all fantasies must take place in a Western, Middle Ages-esque world. Wow – very high praise indeed. I shall keep an eye out for this one.